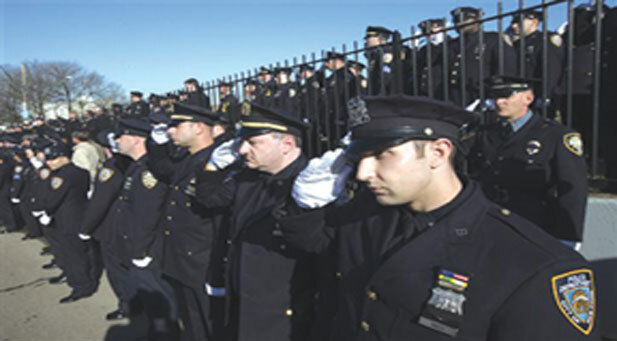 Police officers salute as the hearse of New York City police officer Rafael Ramos drives along his funeral procession route in the Glendale section of Queens, Dec. 27, 2014, in New York. NEW YORK, N.Y. (Reuters) – Tensions between New York City Mayor Bill de Blasio and the police are rooted in issues that go beyond racial relations, the police commissioner said on Sunday, a day after the funeral of one of the two officers slain a week ago in their patrol car. The tensions “involve labor contracts. They involve a lot of history in the city that’s really different from some of what’s going on in the country as a whole,” Bill Bratton said on NBC’s Meet the Press. On Saturday, thousands of police officers assembled outside the funeral of Rafael Ramos turned their backs on the ma-or’s eulogy in a display of disrespect after what they perceived as the mayor’s lukewarm support. A wake for Wenjian Liu, who was shot alongside Ramos, will be held on Saturday followed by a funeral at an “undisclosed location” on recently, the New York Daily News reported. A police spokeswoman said she could not confirm the report. The man who shot Ramos and Liu had pledged to take revenge on police for the deaths of two black men who died in confrontations with white officers this year. The deaths triggered a wave of demonstrations against police violence in New York and other cities, and de Blasio voiced qualified support for the protests. But the killing of Ramos and Liu triggered a backlash. The head of the city’s largest police union, Patrick Lynch, said the mayor had the officers’ blood on his hands. De Blasio has not taken questions from journalists since last Monday. Wiley Norvell, a spokesman for the mayor, declined to address questions about the tensions directly. “Our sole focus is unifying this city and honoring the lives of our two police officers,” he said in an email. Bratton defended the mayor on CBS’s “Face the Nation,” saying the mayor completely supported the police. The commissioner said it was inappropriate for officers to turn their backs on the mayor. Bratton told NBC the city’s leadership would make an effort to meet with union leaders to ease tensions. “I think it’s probably a rift that is going to go on for a while longer,” he said. On CBS, Bratton said police have investigated more than 50 threats against officers since the deaths of Ramos and Liu. “Morale in the department at this time is low, there is no getting around that,” he said. Bratton appeared on the CBS program with Rudy Giuliani, who was generally unequivocal in his support for police during his two terms as mayor. De Blasio was partly at fault for the backlash by police, Giuliani said, but he agreed that officers should not have turned their backs when the mayor spoke. “He created an impression with the police that he was on the side of the protesters,” Giuliani said.